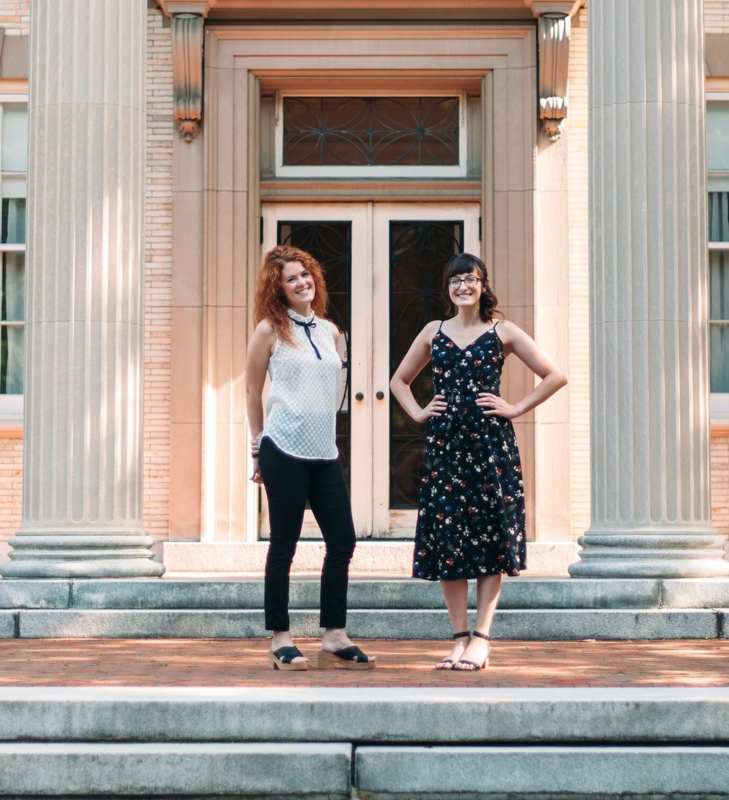 The Women Behind Upstate Social Sessions: Meet Leah Stacy and Danielle Raymo | Rochester Young Professionals, Inc.
We may know that social media provides a window into the lives of people around the world, but how can that window be leveraged into an open door for young professionals? We had the opportunity to sit down with, Danielle Raymo and Leah Stacy, two of Rochester’s most successful women in social media. This week, they will bring together beginner, intermediate, and advanced users for the opportunity to build their networks and professional toolboxes through workshops, presentations, and panels lead by local, regional, and national social experts, entrepreneurs, and thought leaders. Upstate Social Sessions, now in its 4th year, takes place this Friday, October 12, from 8 am – 4 pm at the George Eastman Museum. Get tickets here. Danielle Raymo: I’m a freelance social media specialist, the co-founder of Upstate Social Sessions, owner of the Rochester Brainery, and a board member for Reconnect Rochester. I’ve collected more than nine years experience in brand development and event coordination and received my B.S. in Communication from The College at Brockport. When I’m not working I love making community connections, frequenting local markets, traveling (historical vacations for the win! ), and participating in community theatre (plug: come to see Rocky Horror at Blackfriars, opening 10/26!). Leah Stacy: I once watched a Ted Talk that summarized my career trajectory: Multipotentialite. Over the last 10 years, I’ve worked as editor-in-chief of a city-regional magazine, public relations manager for a regional theater, and freelance writer/videographer for local and national publications. I’m currently a media and communication professor at Syracuse University and Nazareth College, a social media manager and consultant for hospitality brands, associate producer of Rochester Cocktail Revival, and co-founder of Upstate Social Sessions (oh hey!) and Boomtown Table. When I’m not working, I like to do ‘pinkies up’ things with my husband, Pete (drink wine, travel, and see local theatre). LS: I was the editor of 585 Magazine at the time and Danielle was on a cover story. We connected then and two months later I got a facebook message from her saying: I have an idea, do you want to do a social media conference? Naturally, we got coffee at Glenn Edith- where all creative ideas happened in 2015. DR: I had attended social media events in the past, and I knew there was nothing quite like this happening in Rochester. In addition to that, owning my own business, it was hard for me to get travel to larger cities for longer (and often expensive) conferences. I wanted that kind of experience closer to home. I thought others might feel the same way so I said – let’s open up that opportunity here and bring a conference to Rochester, NY. LS: It’s perfect because we had the opportunity to expand our audience here. The past few years we have had an increase in attendees from Syracuse and Buffalo. DR: This year we are labeling sessions beginning, intermediate, advanced. We’re focusing on making sure we are providing something useful for every level. We’re also going to have our main stage (keynote) sessions available to watch online at home, after the conference. That way, if you’d like to attend a breakout session, you don’t completely miss what’s on the main stage. We also made sure to provide a wider array of lunch options on the premises and will be introducing one more food truck. There will be local options for breakfast like Boxcar Donuts, Perfect Granola, Red Jacket Orchards, Hart’s Local Grocers, and Glen Edith Coffee. The after party will be hosted at Living Roots Winery. LS: We’re having a brand new pitch session at the Living Roots after party, too, where people have the opportunity to pitch a 5-minute social media idea and receive feedback. DR: We’re hoping to continue partnering with local community members to grow the conference in a way that we can get more of the community involved. We want to continue to attract national speakers for the opportunity to network with people in the region, who they tweet at but may have never met, but we also want them to have the opportunity to hear from people who are doing things from outside the community as well. LS: We’re also open to talking to people who have a vision and want to partner in the future! DR: It gives you an opportunity to show different sides of yourself. You really get to show people what you can do and what you’re into. If you want to work in sports but your feed is all food, no one in sports is going to know about it. It’s like a digital resume. And for professionals working in social media, it’s a portfolio. I may have never had the opportunity to chat with certain people unless they followed me on social media. LS: It makes advancing your career a lot more accessible. Before you could update your formal resume, now you can reach out to others on the spot. LS: Personal: definitely Instagram. Professional: Twitter- for the news and more conversational connections. DR: Personal: Instagram Professionally: Instagram or Facebook. My business, Rochester Brainery, can be a confusing business if you don’t know what it is. So to be able to put a visual cue to that with these kinds of platforms is so helpful. LS: To just keep walking through doors that open. And to continue to work for myself half of the time, which I’m already doing. DR: I’d have to say the same. I appreciate consistency and value working with my clients, but I’m also open to new opportunities. My career has evolved so much, I hope to continue that. LS: I never would have guessed I’d be where I am right now professionally. I’m most proud of the fact that I’ve said yes to new opportunities even if they’re scary, and I’m going to continue to do that. I want to continue to work on things that put Rochester on the national platform. DR: For me, it was two years ago when I took the leap to quit my full-time job and run Rochester Brainery full time, plus freelance. It comes with its struggles, but I was really proud of myself for doing it. I’m so thankful for the support I had. LS: Danielle! That’s why I work with her. The people who inspire me are the people I work with. DR: I would say the same thing. Anyone I think is awesome, I try to convince them to teach a class at Rochester Brainery- or Upstate Social Sessions.